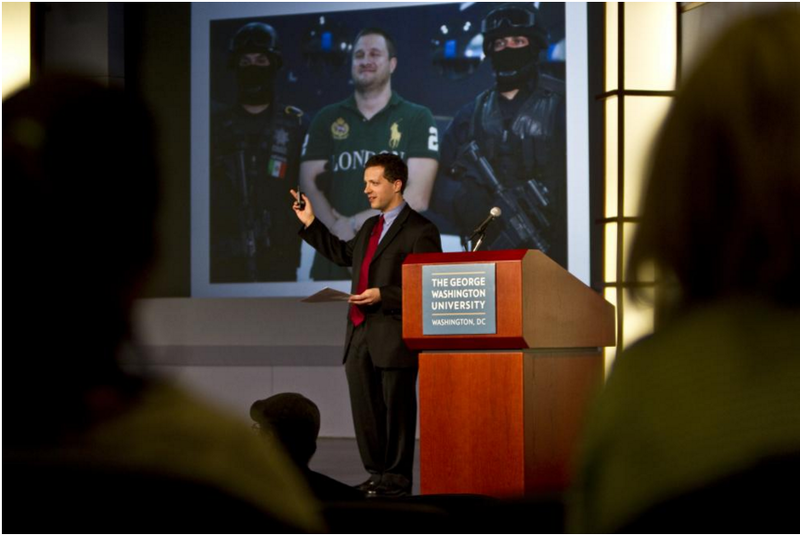 Daniel speaks at George Washington University, 2013. Photo by Meghan Dhaliwal / Pulitzer Center on Crisis Reporting. – Jeff Weeks, Panhandle Tiger Bay Club. I travel throughout the U.S. to give talks. I’ve appeared at Princeton University, City University of New York School of Law, Kenyon College and Seattle University, national journalism conferences and many other colleges and trade groups. In the Memphis area, I have appeared at small book club meetings, at retirement communities and before hundreds of high school and elementary school students. I’m represented by Macmillan Speakers Bureau. To book me, please contact Julianne Lewis at 646-307-5544 or julianne.lewis@macmillan.com. Here’s a rare joint appearance with me and Isaias Ramos on book launch night, October 4, 2016 in Memphis. Here’s video of me speaking to the Panhandle Tiger Bay Club in Pensacola, Florida on February 17, 2017. Lots of tough questions from the audience! Thursday, June 16, 2016. Investigative Reporters and Editors conference, New Orleans, Louisiana. Tuesday, August 30, 2016. Latino Memphis Congreso. Saturday, September 10, 2016. Mid-South Book Festival. News Engagement Day at The University of Memphis Department of Journalism and Strategic Media. Book launch at The Booksellers at Laurelwood in Memphis. Wednesday, October 5. Barnes & Noble at Vanderbilt University in Nashville. Thursday, October 6. Off Square Books / Thacker Mountain Radio. Oxford, Mississippi. Wednesday, October 12, 2016. Twitter chat with Georgetown’s Center on Education and the Workforce. @GeorgetownCEW. Thursday, October 13, 2016. Speaking on the radio show Think on KERA in Dallas. Saturday, October 15, 2016. Southern Festival of Books, Nashville, Tennessee. Tuesday, October 18, 2016 at 6 p.m. Tompkins County Public Library. Ithaca, New York. Wednesday, October 19, 2016. 2:30 p.m. Rutgers University-Newark, hosted by the Center for Migration and the Global City. Newark, New Jersey. Thursday, October 20, 2016 at noon. Princeton University. Colloquium series sponsored by the Center for Migration and Development and the Program in Latino Studies. Friday, October 21, 2016. The Mexican Community Accessing Education Symposium. CUNY School of Law. Queens, New York. Organized by The Jaime Lucero Mexican Studies Institute and the Anchoring Achievement in Mexican Communities Initiative of the Deutsche Bank Americas Foundation. Thursday, February 16, 2017. University of West Florida, Pensacola, Florida. Friday, February 17, 2017. Panhandle Tiger Bay Club. New World Landing. 600 South Palafox Street. Pensacola, Florida. Saturday, February 25, 2017. Seattle University, Seattle, Washington. Search for Meaning Book Festival. Pigott 201. March 9, 2017 Tennessee Teachers to Speakers of Other Languages conference, Memphis, Tennessee. March 11-12, 2017. Tucson Festival of Books, Tucson, Arizona. Gave five talks and panels. March 21, 2017. Books & Beyond Book Club. Benjamin L. Hooks Central Library, Memphis, Tennessee. March 25, 2017. Taught at Oxford Writes Spring Workshop. March 28, 2017. Food for Thought group, Memphis. April 13, 2017. Allenby Lakes Book Club, Memphis. April 29, 2017. Keynote speaker at Bookstock, the book fest organized by Memphis public libraries. June 1, 2017. Education Writers Association National Seminar, Washington, DC. June 24, 2017. Investigative Reporters and Editors conference. Phoenix, Arizona. July 29, 2017. Poplar-White Station Library, Memphis, Tennessee. August 5, 2017. Taught at Byhalia Christian Writers Group. Byhalia, Mississippi. October 5, 2017. Spoke at Character Day at Jackson Elementary School as well as Southern Foodways Symposium. Memphis, Tennessee. October 12, 2017. University of Memphis – modern languages department, class visit to honors seminar on immigration. October 25, 2017. Servicemaster Corp. Memphis, Tennessee. November 4, 2017. Byhalia Christian Writers Group. Byhalia, Mississippi. I spoke on navigating the world of book agents and publishers. Tuesday, November 7, 2017. Ohio University. Athens, Ohio. Journalism school. Wednesday, November 8, 2017. Kenyon College. Gambier, Ohio. My alma mater! I gave a talk on the Book of Isaias and the secret history of immigration in the U.S. 7 p.m.-8:30 p.m. Community Foundation Theater in the Gund Galley, GAL 001. Thursday, November 9, 2017. Kenyon College, Gambier, Ohio. Pierce Lounge. I spoke on careers in journalism. Dec. 6, 2017. Wednesday Book Club – Germantown. Jan. 8, 2018. Buntyn Presbyterian Church. Meeting of Church Women United. 561 S. Prescott. Memphis, Tennessee. February 7, 2018. Muddy’s Bake Shop book club. Feb. 15, 2018. Skype session with the book club at The Education Trust in Washington. Thursday, March 22, 2018. Oxford Conference for the Book. Oxford, Mississippi. I spoke on the Latino experience in the South with Simone Delerme (moderator), and fellow authors Leon Fink and Angela Stuesse. April 19, 2018. Shady Grove Presbyterian Church book club, Memphis. April 28, 2018. Presbyterian Women’s Annual Gathering. Memphis. May 11, 2018. Cornerstone Prep – Denver Campus. Spoke at a career day for elementary school students in Memphis. June 19, 2018. Pax Christi monthly meeting, Memphis. August 1, 2018. Presentation to AP English teachers. Central High School, Memphis. August 28, 2018. Kirby Pines Retirement Community book club. September 27, 2018. River Readers Book Club of the First Unitarian Church of Memphis. November 6, 2018. Class presentation to Jessica Swan’s writing students at University of Memphis. Nov. 12, 2018. Book club dinner with attendees of conference of NAFSA, the professional association for International Educators. December 12, 2018. Presentations at Wyoming Seminary Upper School. Kingston, Pennsylvania. 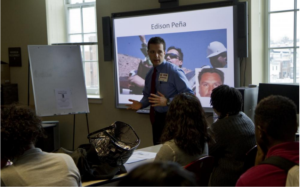 Daniel speaking with students at McKinley Technology High School, Washington D.C., 2013. Photo by Meghan Dhaliwal / Pulitzer Center on Crisis Reporting.